Bordeaux, France, — April 14, 2004 — EADS Sogerma Services has been selected to supply its Class 180 cocoon-type first-class seats for Korean Air's widebody Boeing aircraft, marking a strategic contract win in the Asian region. 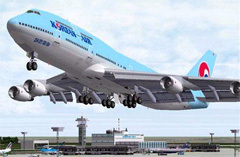 The seats will be retrofitted on Korean Air's existing Boeing 747-400s beginning in the first quarter of 2005, followed by their installation on new-production 777s scheduled for delivery beginning the same year. Announcement of the order was made today at the Transport & VIP Interiors Expo in Ft. Lauderdale, Florida, where EADS Sogerma Services is participating in the conference program and exhibition (exhibit stand: A605). The Class 180 seats provide premium first-class comfort and privacy, with features that include a cocoon-type enclosure, a full-recline capability to 180 deg., and electrically-powered seat backrest, seat bottom and leg rest. For Korean Air's installation, the Class 180 seats will be equipped with a 15-inch video screen, Internet connection and a power outlet for computers. An additional feature is an extendable "buddy seat" that accommodates another passenger for work or conversation during the flight. "Korean Airlines' selection of the Class 180 seat followed an international evaluation, during which the industry's leading seat designs were judged in a true competition," explained Pierre-Antoine Vacheron, EADS Sogerma Services' Senior Vice President, Cabin Interiors & Completion. "We welcome Korean Air as an important new Asian region customer for the Class 180 seats." With a fleet of 117 aircraft, Korean Air is one of the world's top 20 airlines and operates almost 400 flights per day to 85 cities in 29 countries. The airline is a founding member of SkyTeam, the global alliance partnering with AeroMexico, Air France, Alitalia, CSA Czech Airlines and Delta Air Lines. EADS Sogerma Services is an industry leader in cabin outfitting, aircraft maintenance/modification, and aerostructures. A wholly-owned subsidiary of EADS, the company employs more than 4,100 employees at locations in France, the United States, Canada, Tunisia, Morocco and Hong Kong. It provides a full range of support services for commercial airliners, military aircraft and business jets.